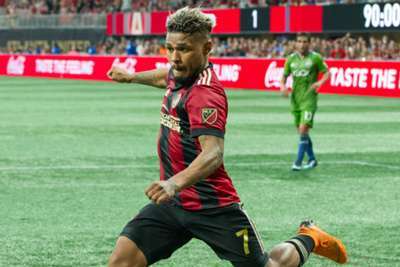 Josef Martinez is on track to shatter the MLS single-season goalscoring record after taking his tally to 27 in Atlanta United's 3-1 win over Columbus Crew. Venezuela international and former Torino forward Martinez tied the record with his 31st-minute goal against the visiting Crew on Sunday. Martinez broke the deadlock for Eastern Conference leaders and Supporters' Shield pacesetters Atlanta when the 25-year-old curled a shot past Columbus goalkeeper Zack Steffen. That strike matched the achievements of Bradley Wright-Phillips (2014), Chris Wondolowski (2012) and Roy Lassiter (1996) with nine matches still remaining. "I tied it, but what I really want is to break it," said Martinez. "Once I break it, then I'll be even more happy. When I get to 28, then I'll have something." Gyasi Zardes equalised five minutes into the second half but quick-fire goals from Hector Villalba and Miguel Almiron – who was played in by Martinez – ensured Atlanta stayed three points clear atop the east. The Crew, meanwhile, remain fourth and 12 points adrift of Atlanta after their three-game winning streak was ended. Elsewhere, the resurgent DC United moved within six points of the play-off positions with a 2-0 win over 10-man New England Revolution, while high-flying Los Angeles FC defeated Colorado Rapids 2-0. 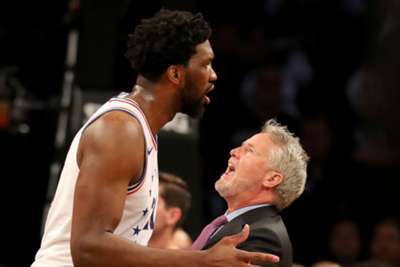 The Philadelphia 76ers claimed a commanding 3-1 lead in the Eastern Conference opening-round series after topping the Brooklyn Nets.